The ELCA Outreach Center in Kenosha provides a free, 6-week summer camp for more than 100 elementary school children. Outreach Center Executive Director, Karl Erickson, explains that this summer camp, primarily attended by children living in low income households, fulfills two missions: It gives children a safe and fun summer learning environment, and provides paid work opportunities with extraordinary life experience to high school and college camp counselors. 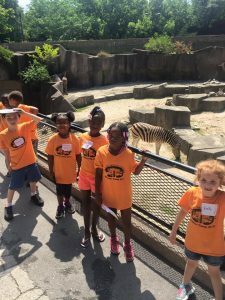 Through activities including sports, swim lessons, and crazy-fun field trips, tempered with work on school subjects such as math, science, reading and art, camp counselors and campers form a life-changing connection. Looking at post-camp evaluations and comments from the counselors, it is apparent that both they and their summer wards are enriched physically, mentally and spiritually from the camp experience.